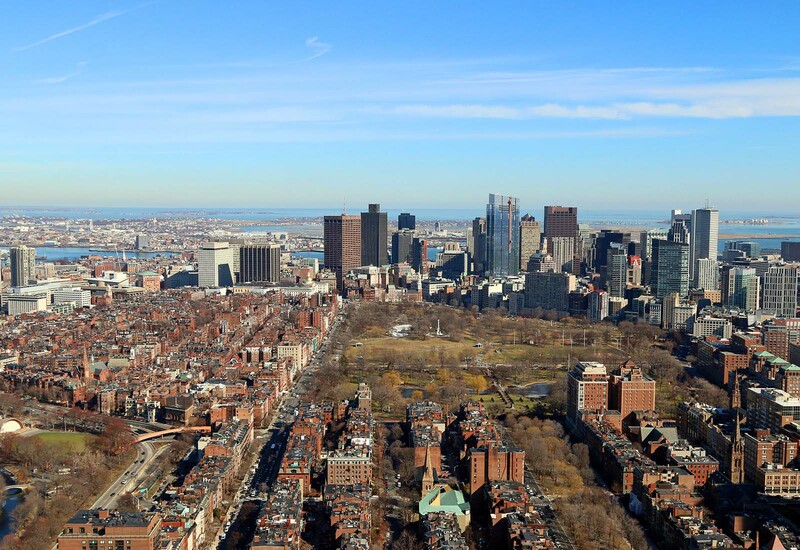 A helicopter equipped with radiation-sensing technology will make several low passes over the Boston Marathon route later this week (April 12th-16th) to measure naturally occurring background radiation ahead of the 120th Boston Marathon next week. Between Tuesday and Friday, the National Nuclear Security Administration will use the chopper to measure background radiation along the 26.2-mile marathon route and slightly beyond, flying a twin-engine Bell 412 helicopter in a grid pattern at about 150 feet above the ground at speeds of about 80 miles per hour, the agency said. "We are flying the survey at the request of the marathon coordinators and the state and local authorities," Shelley Laver, deputy director of public affairs for the NNSA, told the News Service. "That data that we collect is provided to said parties and gives them a baseline of what the situation looks like today." The NNSA has conducted a radiation survey in the Boston area before the Boston Marathon each of the last two years. Three years ago, terrorists detonated two pressure cooker bombs near the marathon finish line, killing three and injuring more than 260 spectators. According to the United States Government Accountability Office, "the surveys can be used to compare changes in radiation levels to (1) help detect radiological threats in U.S. cities more quickly and (2) measure contamination levels after a radiological attack to assist in and reduce the costs of cleanup efforts." "If something were to occur, they would have that, and if there was suspicion of some sort of a use of nuclear or radiological source in any kind of event, federal, state and local teams would come in and assess and be able to do a comparison to the baseline," Laver said. The NNSA said it wants the public to be aware of the scheduled flights so as to not be alarmed when a 56-foot helicopter buzzes overhead. Noise can be defined as any unwanted sound such as the noise of dogs barking, neighbors playing loud music, or road traffic sounds that spoil the 'quiet of the countryside'. New England Helicopter Council acknowledges that excessive aircraft noise can be annoying and inconvenient and, at the extreme, may interfere with normal activities. We encourage our members, and all helicopter operators, to voluntarily adopt the Helicopter Association International (HAI) Fly Neighborly Program. The Fly Neighborly Program addresses noise abatement and public acceptance objectives by addressing concerns such as: -Pilot and operator awareness of the public's concerns about helicopter noise and safety issues, -Training pilots to Fly Neighborly, -Planning flight operations to minimize helicopter noise, and -Addressing the communities concerns about helicopter operations. Helicopters produce noise from various sources on the vehicle including its engines, gearboxes, drive systems and rotor systems. Typically, the most noticeable noise generated by a helicopter is the modulation of sound created by the aircraft's main rotor. This modulation attracts attention, much as a flashing light is more conspicuous than a steady one. The resulting modulated sound wave, known as 'blade-slap', is generated out in front of the helicopter and produces a sound that is loud and annoying to people on the ground. The helicopter's tail rotor also contributes to vehicle noise and varies from nearly quiet to a low pitched whine, or drone, and in certain designs, a high pitch fluctuating shrill. Pilots are requested to utilize the following noise abatement procedures whenever possible. Of course, it is the pilot's responsibility on each flight to determine the actual piloting techniques necessary to maintain safe flight operations. Minimize ground operations. Minimize duration of warm-up and cool-down periods and avoid idling at heliports and airports for prolonged periods. Takeoff. Depart into the wind and climb as quickly as practicable to cruise altitude. In the absence of other takeoff restrictions, consider climbing at Vy (best rate of climb) airspeed. Cruise. Whenever possible, maintain 2,000 feet above ground level over noise sensitive areas (Per FAA AC 91-36 "VFR Flight Near Noise-Sensitive Areas); follow published helicopter routes and comply with noise abatement procedures established at the heliport or airport where you're flying. Approach and landing. Use steep approach angle when possible. Follow the helicopter manufacturer's recommended Noise Abatement Approach Profile. Maneuvering. Avoid the high noise regime for your helicopter. For example, many helicopters have a high noise regime while descending at 300 fpm at, or close to, 70 knots airspeed; minimize this noise by initiating a descent at higher than normal airspeed. Speaking of airspeed, some helicopters emanate more annoying noise when flying at speeds above 130 knots; minimize this noise by slowing down when flying over noise sensitive areas. Avoid steeps turns will result in reduced noise impact. Applying gradual and smooth control inputs while maneuvering also reduces noise propagation. Night operations. Be particularly sensitive to your helicopter's noise signature at night. Helicopters are perceived to be particularly annoying at night when the vehicle's noise is not mingled with other background noise. Fly Neighborly. Please refer to the HAI Fly Neighborly Program for additional information on how to minimize your helicopter's noise impact. Inbound: Southern end of Nantasket Beach at offshore rocks, cross inlet to Worlds End, via the coastline to the Long Island Bridge then to channel to the Coast Guard Station. Note: It is recommended that the Bay Route be used by multi-engine and float equipped helicopters due to the low altitudes occasionally imposed. The outbound route is the reverse of the foregoing description. Refer to the Boston Helicopter Route Chart for waypoints and coordinates. Note: Entry point is within the Norwood Class D airspace. CONTACT NORWOOD TOWER on the appropriate tower frequency. Inbound: At the intersection of I95 and I93 and the Contrail tracks. Follow the Contrail tracks to the Fens (passing over the Fens east of Fenway Park and west of the Prudential Building). Join the Turnpike Route. The outbound route is the reverse of the foregoing description. Refer to the Boston Helicopter Route Chart for waypoints and coordinates. Note: Entry point is just outside the Hanscom Class D airspace. Contact HANSCOM TOWER on the appropriate tower frequency. At Rte 2 and the Watertown Street Exit in Lexington. (Also Spy Pond Route). Follow Rte 2 to the southwestern edge of Spy Pond, then direct to Harvard Stadium Athletic fields, then direct to Allston Toll Plaza on I90, then join Turnpike Route. The outbound route is the reverse of the foregoing description. Refer to the Boston Helicopter Route Chart for waypoints and coordinates. At the intersection of I93 and I95 in Woburn. Follow I93 to the Charles River then join the Turnpike Route. The outbound route is the reverse of the foregoing description. Refer to the Boston Helicopter Route Chart for waypoints and coordinates. VPQUA begins at Rte 24 and I93, then to Rte 3 and I93 in Braintree. VPQUB begins at Rte 3 and Union St. (Armory), then to Rte 3 and I93 in Braintree. Follow the Expressway to the Mass Ave interchange, then along the Fort Point Channel to the Coast Guard Station. The outbound route is the reverse of the foregoing description. Refer to the Boston Helicopter Route Chart for waypoints and coordinates. Note: Logan RWY 4R/L operations may require helicopter assigned altitudes below 300 AGL. Helicopter route assignments and altitudes do not relieve pilots from FAR 91.119 and 135.203 (b) compliance. If necessary, pilots are expected to request an alternate route clearance for compliance. Note: Entry point is just outside the Hanscom Class D airspace. Contact HANSCOM TOWER ON the appropriate tower frequency. At Rte 2 and the Watertown Street Exit in Lexington. (Also Fresh Pond Rte). Follow Rte 2 to Rte 16 the Alewife Brook Parkway to I93 and join Hampshire Route. The outbound route is the reverse of the foregoing description. Refer to the Boston Helicopter Route Chart for waypoints and coordinates. At the intersection of Rte 1 and I95 in Lynnfield. Follow Rte 1 to the Mystic River Tobin Bridge, then along the Inner Harbor to the Coast Guard Station. Refer to the Boston Helicopter Route Chart for waypoints and coordinates. At the intersection of I90 and I95 Weston Tolls. Follow the Mass Turnpike to the Allston Toll Plaza, then along the Charles River and the Inner Harbor to the Coast Guard Station. Refer to the Boston Helicopter Route Chart for waypoints and coordinates.